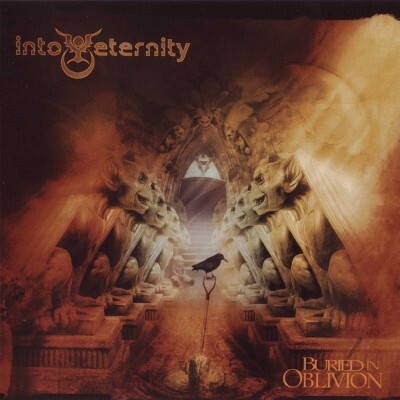 Canada’s Into Eternity redefine and set new boundaries for progressive metal with their release, Buried In Oblivion. Layered vocals with a European flair are mixed with a very aggressive, almost death approach. The two styles work well together. Musically, this band plays with the same melodic/heavy mix as the vocals. The pace of this album just never quits. I waited for the album to drag at some point, but to my amazement, it kept rolling with an undeniable intensity from one song to another. Chris Krall was brought into the band as lead vocalist for the writing and recording of Buried In Oblivion. The vocals are equally as complex as the music, with all five members contributing to the vocal tracks. The results of the multiple vocal inputs are clean singing, rich harmonies and a variety of death vocal sounds. Musically, founding members Tim Roth (guitar) and Jim Austin (drums) are joined by Rob Dohery (guitar) and Scott Krall (drums), all sounding as if they’ve been performing together for decades. While the music features heaviness that would rival some of the more extreme bands out there, at other times, such as the title track, the band uses nothing but acoustic guitars and a string section. The variety in the music isn’t a hard transition—the band moves from one approach to another with seamless perfection. One of the strongest metal albums of the year to date is The Forsaken’s third release, Traces Of The Past. This band has taken the somewhat over-worked Swedish metal formula to the next level with an inventive mix of aggression and technical ability. While the obvious At The Gates, The Haunted and The Crown comparisons hold some amount of water, The Forsaken’s infusion of their brand of melodic guitar harmony definitely sets them apart from their Swedish counterparts. While the guitarists use Traces Of The Past as their personal riff dumping ground, the music never sounds too busy or disjointed. Their very creative thrash/death style of play keeps the release moving along at a nice clip, while their less-than-subtle duel guitar grooves hold everything together. Awesome solos too! The U.S. version of Traces Of The Past includes two Metallica covers (“Blackened” and “Creeping Death”), Slayer’s “Spirit In Black”, and Grave’s “You’ll Never See”. The U.S. version also includes the previously unreleased track “Project : The New Breed 666″.